Our aim is to provide high quality electrical services in the area. We take great pride in the way we deliver our service and we always strive to achieve complete customer satisfaction. The office based team at PGS are always available so if you have an queries about a new job you'd like to arrange or a job that is in progress you'll always be able to make contact with us and promptly receive the assistance that you require. Detailed below is a selection of the electrical services we can provide, the list is not exhaustive so if in doubt call our office team and we'll be glad to advise. In addition to the electrical services detailed above we also have a plumbing division which means that in most instances we can provide you with a comprehensive service, especially when it comes to carrying out work in your bathroom or kitchen where water or gas is also often involved. For those jobs that may require the services of both a plumber and an electrician PGS have it covered. We are able respond to emergencies quickly and we never charge a call out fee. 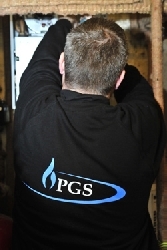 If you experience an emergency call PGS Electricians straight away for immediate attention. PGS have vast experience in working on behalf of landlords and property managers, we have the processes and systems in place to be able to provide a high level of service. We are happy to receive works orders via email or fax and on the day of the work we provide wirtten job reports and feedback. Additionally, we can liaise with tenants, our engineers are always polite and well presented and we meet all insurance and accreditation requirements.